From the rear side cover: In May 1945 Italy was liberated from Nazism and Fascism by the British Eighth and American Fifth Armies. By that time the Italian resistance movement had emerged as one of the strongest in Europe - crucially aided and abetted by the UK's Special Operations Executive. As what Winston Churchill graphically described as the 'red-hot rake of the battle-line' advanced bloodily up the Italian peninsula, clandestine cells in the cities and partisan bands in the countryside fought to free their country from enemy occupation and shape the politics of Italy's post-war future. 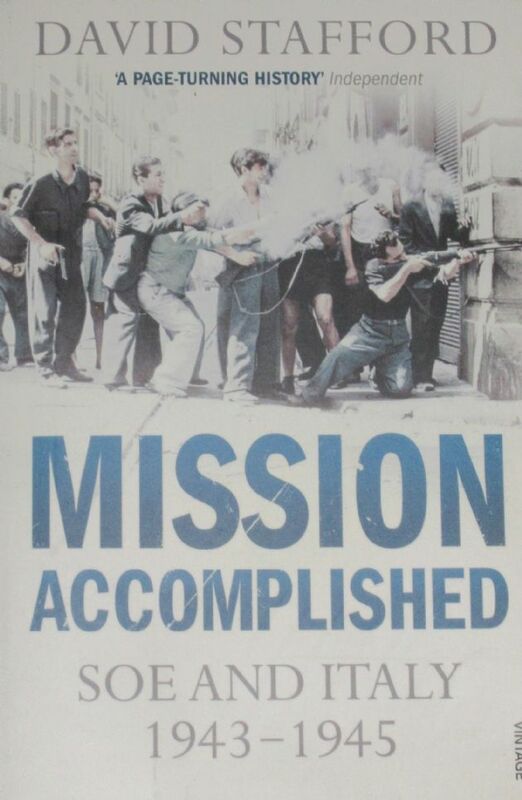 Based on recently released official files, documents retrieved from other agencies, diaries, memoirs and personal interviews, Mission Accomplished provides the first ever complete and authoritative account of Britain's secret war in Italy - the heroic exploits, the larger than life participants and the extraordinary, against-the-odds achievements.